Discussion in 'Epson InkJet Printers' started by Julia, Apr 3, 2019. Because Fine-art paper is expensive, I do several proofs small on the same sheet of paper checking colours etc. Every now and again when there are already one or two prints on the page, the printer may a) just print a narrow strip, b) or pretends to print (noise of printing) and nothing comes out. c) or, despite loading having been fine, goes to cancel and makes it impossible to get the paper out (appropriate buttons wont work) until you are obliged to press print in desperation...at which it prints my proof some inches down from where I have designated it! I presume there must be some sort of sensor. In desperation I turn the paper upside down and then it prints in the right place (meaning meaning where I have positioned it on 'print with preview'. This has happened several times. I wouldn't mind knowing why, and how to avoid it as it is time-consuming and a pain! Particularly trying to get the paper to eject when it had loaded perfectly OK.
Just a small tip for owners of this machine... having had trouble with back loading...(as with my previous Epson R1800) very capricious about taking the paper, I find that holding the paper guide closely to the paper so it has almost no room for movement seems to solve the problem. Other than the above problems the printer prints very well and crisply. I think the orange ink instead of an additional blue was a bad choice as there is a constant bias towards cyan (the only blue it has)...however that probably doesn't affect most people. I would be interested to hear if others have had these behavioral problems...and if anyone knows why. I'm running a P400, but don't have the problem as you are reporting it, it is feeding paper , all sorts of, without problem. I don't think you should hold the paper guide as long as the printer is pulling it in, the left paper guide is already in movement by the printer closing any gap . Where do you locate your check prints on the paper, can you show a sequence how you fill up the paper by multiple prints - by scanning a sheet and numbering it. It could be that the top of sheet sensor recognizes a preprinted area and skips over it. I am an artist, just so you understand my own logic. I need to get colours and contrasts exact. Sometimes I will print 9 on a page so I can see what I am getting. First I print on Epson Matt Heavyweight...then fine tune on Somerset enhanced velvet (which will take my eventual larger print A3 or A4). I am revising all the while in Photoshop. I want to be able to repeat print and have it identical. Sometime it is 4 on a page as I get them bigger and more similar to the eventual prints. It seems to be those in particular that create this problem. What you say implies that you know there is a sensor. I didn't know that...just guessed something like that had to be the case. Do you know what rules the sensor is applying? The normal paper feed for plain paper or matt heavyweight works fine. I have always had problems (not quite a 'newbie' to printing as I have been doing it for 19 years!) with back loading. Having found with this current printer a similar reluctance to always take the paper, I have found what I have described works. Obviously one is not heavy handed about it but making sure the guide is very close to the paper as you feed it in seems to have solved the problem, for me anyway. Otherwise, it takes the paper in nicely enough (referring to back-loading) and promptly throws up!...making one curse and wonder why. yes, there are typically sensors for edge detection and top of form, the printer otherwise could not handle correctly borderless printing and would not know where to start printing. It could be just one at the bottom of the printhead. Printed sections at the beginning of a page may obscure the view for those sensors . Back loading - how thick is your paper ? Are you talking about single sheet feeding from the rear paper tray or the straight path for thick papers ? did you have this problem from the beginning ? And any contact with Epson service already ? Thanks very much...confirms my suspicions. At first I thought maybe I needed to return the printer and then thought on about the 'clues'. I will have to put up with it! It was as if some demon had got in. Seemed to be no reason. The paper I use is Somerset Enhanced fine art ink jet paper Velvet Radiant White, acid free, archival. 225g (St Cuthberts Mill)....to give it its full title! Pretty well identical with Epson's own I think (probably made by the same people!). Mine is a bit cheaper. 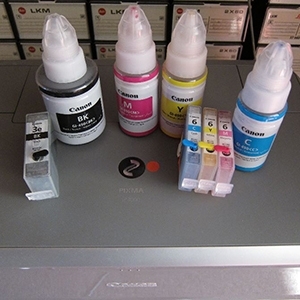 It is all very expensive and I only ever use Epson's own inks. I certainly don't sell enough to cover costs. I have always used this paper. Used it for 10 years with the R1800, which sadly despite all my efforts could not be resuscitated...and I have only just bought the SC 400 (well about 5 months ago) and have been using it a lot. Unfortunately I have had to do a lot of work to re-establish the right colours for old designs (pictures) as it doesn't interpret my existing designs identically. As I say, I use Epson matt for initial designing and proofing (front loading area) and switch to back-loading for single sheet art paper. Haven't tried all the other tricks I have read it can do, and probably never will. Intrigued about the canvas papers...but not my scene really. Thanks you for the information. https://juliamatcham.wordpress.com if you would like to see what I do. You asked if I had any contact with Epson service...only with the old printer which I am sure could have gone on had they been willing to service it, but they had stopped making the ink pads...obviously it serves them to make stuff obsolete. I persevered nevertheless, had it reset...but it started blocking up and I spent love and money on it trying to get it going with a million different solutions. In the end I had to admit defeat. I loved that printer! Epson haven't a good record...but then looking for another printer to replace it, I found none of them have a good record. What can you do?! I am an old lady; picking the new one up caused a lot of pain for some time and I can't heave it around to people to have it fixed. Not that there are many choices for that. Epson have a long misleading list of service agents because my experience is that they may service the cheap ones but they don't do the expensive ones. And they don't collect. So I just have to hope this one will last as long as the last one! Please check the placement of your prints on the page, try to arrange them such that you start at the bottom, so that there is always white paper at the top when the printer pull the page in the 2nd time. Please report back if you find any change in behaviour of the printer, remote diagnosis is not always easy . Is it possible so see a scan of a page which is causing a paper feed problem ? Then going to bottom left a thin stripe. Tried again and it printed an even thinner stripe over the original one. Turned the paper upside down and it printed normally. Other related problems as I said is that it will take the paper perfectly but then persistently comes up with cancel and then the paper button will NOT eject the paper until one is forced to print which it does some inches down from where one had positioned it from print with preview (terrible waste of paper if you are using the good stuff!) Can't find that page. This being said, now I know that it is not an actual fault in the machine, I will work around it. Oh yes, and don't forget the ghost printing when one hears the sound of printing and the paper feeds through with nothing on it! What IS it doing! But it is always in the context of several prints on one page. And yet printing, for example 4 small prints across 3 deep (meaning 12 prints) doesn't cause a problem. It seems to be 4 on a page that is the most anticipatable problem. When it comes to printing a large image on a sheet, I haven't come across any problem. Most people are not doing what I do, so it probably will never trouble them. NB They all look the same but infinitesimally, they are not!